The stunning report provides a first hand account of in some instances Chinese ships turning off their transponders ("ghosting" international trackers) to covertly transfer petroleum products to North Korean bound tankers on the open waters. One of the two smaller ships began to quickly move away from the group as the other loosened its mooring to the tanker. Both of the smaller ships carried Chinese flags. 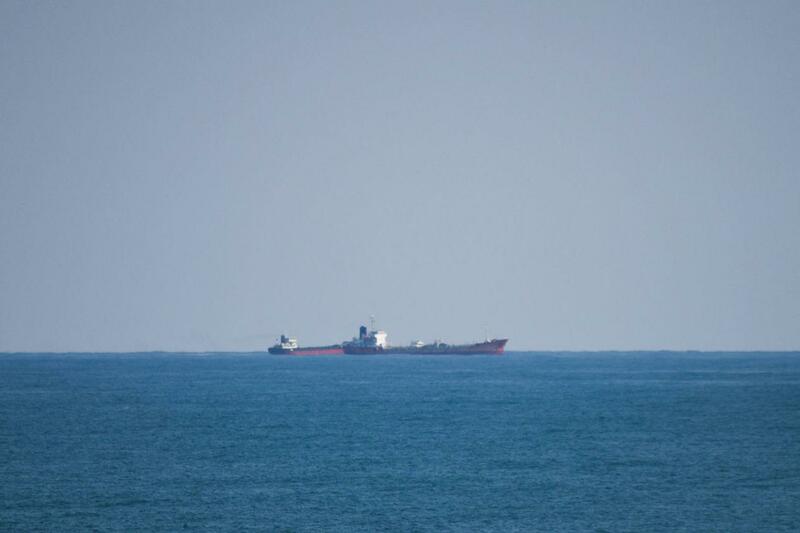 No flag was visible on the tanker. The Milius’s commanding officer, Cmdr. Jon Hopkins, set a course to pull alongside the tanker. “We got them,” said a Milius crew member on lookout duty. The United Nations over a year ago imposed tight limits on North Korea's ability to import oil and petroleum products due to its banned nuclear testing and missile program. Via the WSJ: "The Milius changed objectives on April 1 after the sighting of other suspicious activity. Here, the Oceanic Success, a Mongolian-registered oil-products tanker, is seen from the Milius appearing to conduct a ship-to-ship transfer with a vessel directly behind it. A third ship with a red hull to the left appeared to be waiting to take part in a transfer with the Oceanic Success." But Pyongyang has long been known to engage in aggressive sanctions thwarting behavior, including conducting ship-to-ship transfers at sea. In response, for the past year a UN group of countries including the U.S., Japan, South Korea, Canada, Australia, New Zealand, the U.K. and France, have patrolled a region covering 700,000 square miles in order to clamp down on sanctions evading. Surveillance planes have also been active over the international waters, and the WSJ notes that the United States has conducted up to half of all operations among the eight UN countries. 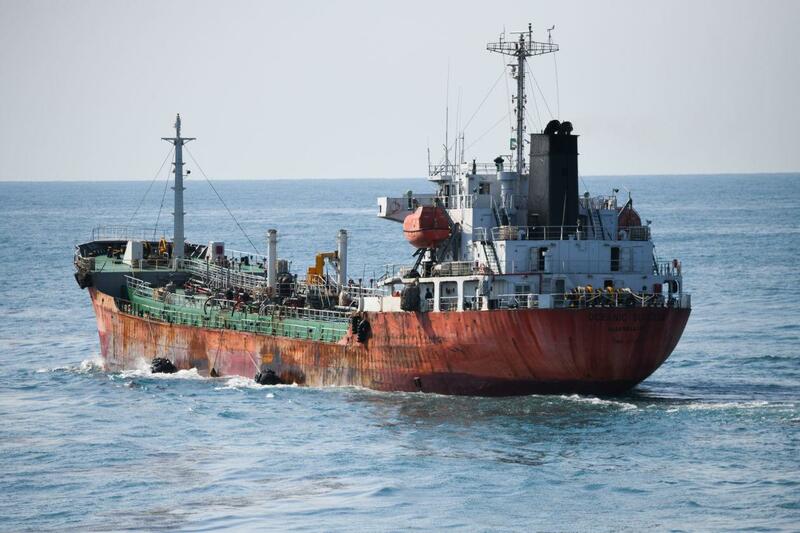 The surveillance side of operations is geared toward blacklisting shipowners observed engaged in illegal transfers with North Korean vessels — these ships will in turn be banned by UN countries from entering international ports. Perhaps most significant about the WSJ story is that ships were filmed and photographed in action. They were caught preparing for the illegal transfers as USS Milius naval operators and the WSJ crew looked on. Via the WSJ: "As the Milius approached the three ships they sailed away from each other. Hoses and fenders seen here on the side of the Oceanic Success indicate that it was involved in a ship-to-ship transfer." 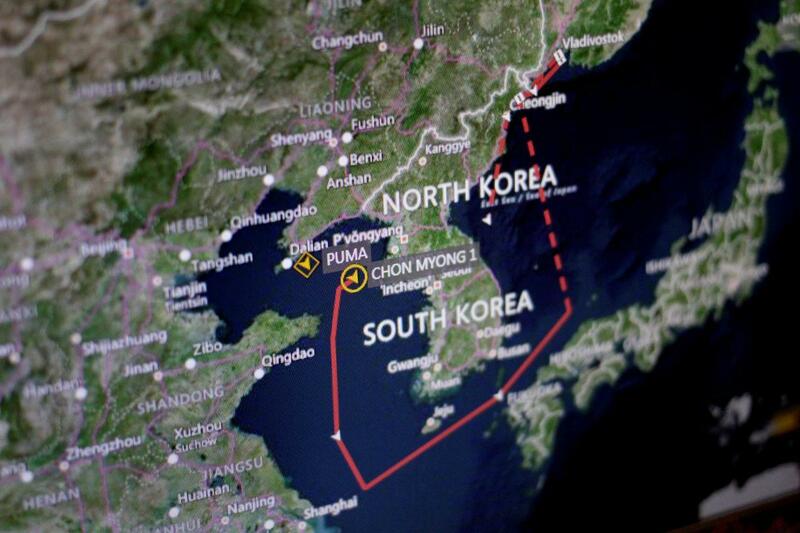 As it rounded the peninsula, the North Korean ship was also being monitored by a South Korean P-3 surveillance plane, while a Chinese destroyer followed the American and Japanese ships from a distance of around 12 miles. U.S. Navy officials say Chinese warships commonly shadow U.S. naval vessels in international waters in the East China Sea. The parade of four ships continued through the night, led by the slow-moving Kum Un San. Some among the blacklisted or at least suspect ships monitored, such as the Mongolian flagged Oceanic Success, include tankers with the capacity to transfer up to 50,000 barrels of motor gasoline to North Korea — which alone constitutes one-tenth of the what the UN allows under the North Korea sanctions and restrictions. But worrisome is that this appears another large scale US-spearheaded operation which could bring American vessels into conflict with Chinese warships.